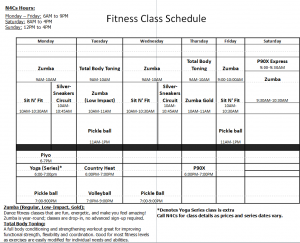 All classes are included in an N4Cs membership, unless otherwise noted, drop in fee option for non-members. Meet Melissa, your class instructor for many of our fitness classes! 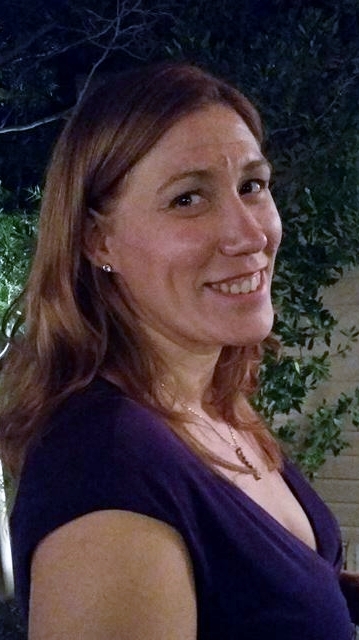 Melissa Humm is a local instructor who is an ACE group fitness certified instructor, who is also licensed to teach many popular classes such as P90X, Country Heat, Zumba and Silver Sneakers (Classic, Cardio Circuit and Yoga). Feel the rhythm in this high energy, calorie burning class that feels more like a party than a workout. Let the fun international music, latin beats and current pop music move you through easy to follow choreography designed to boost your heart rate, burn fat and build muscle tone. Appropriate for most ages and abilities! Low Impact/Gold – Slightly slower pace with less twisting and no jumping, great for the 55+ or those dealing with injuries and beginners of all ages and abilities. 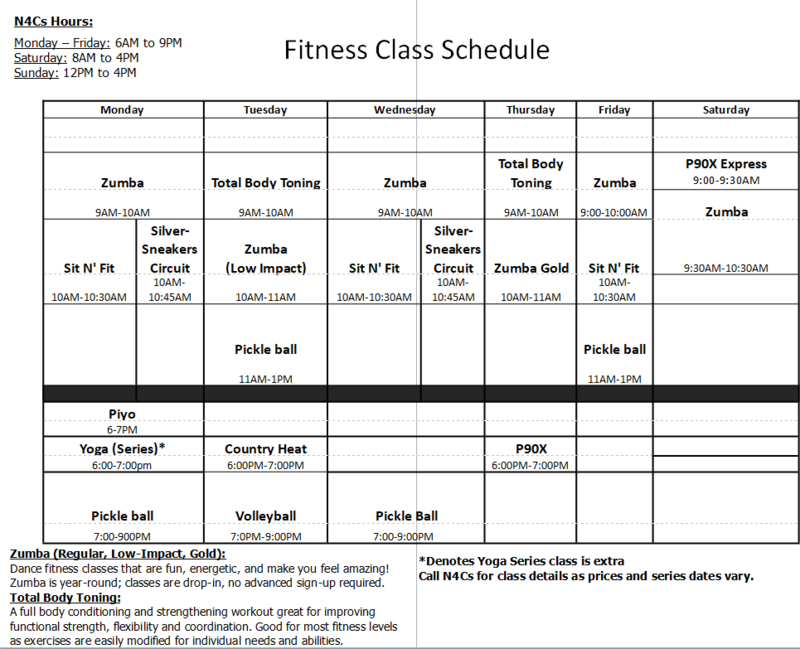 Class focuses on all elements of fitness, cardio, muscular conditioning, flexibility and balance. Join us for an intense blend of pilates and yoga guaranteed to tone and strengthen every inch of your body. This class requires floor work, so bring your yoga mat! If you don’t have one, we have some you can borrow! Line dancing inspired dance cardio workout with Easy to follow moves broken down step by step to build towards a full 16 move routine. Set to your favorite country hits both old and new! Cool down with a short, low impact strength segment to tone muscles and strengthen your core. Appropriate for all ages and abilities, especially great for beginners! Steadily increasing intensity makes this class an excellent fat burning workout anyone can have fun doing! Push yourself to the max with this total body workout from Beachbody that will take you through cardio, lower strength, upper strength and core segments to increase stamina, core strength and slim down and tone up from head to toe! Modifications are demonstrated for beginners to build towards proficiency and strength. All abilities are welcome, but those looking for a challenge will get the most benefit. A full body conditioning and strengthening workout great for improving functional strength, flexibility and coordination. Good for most fitness levels as exercises are easily modified for individual needs and abilities. Combine fun with fitness to increase your cardiovascular and muscular endurance power with a standing circuit workout. Focus on upper body strenght and hand held weights and use resistance tubes and a SilverSneaekers ball for a low impact workout. **Find out if your insurance plan offers the SilverSneakers® Visit www.silversneakers.com or call the number on your health plan ID card. SilverSneakers® gives you: A basic fitness membership with nationwide access to participating location, Custom-designed classes and use of equipment, A Senior Advisor to help you along the way and Member-only access to online support! If your plan doesn’t offer SilverSneakers®, ask when they’ll be adding this valuable benefit! This low-impact exercise is perfect for older adults to build strength and stay active. This exercise program provides you the opportunity to strengthen your muscles without the impact of running or intense movements. Come try the best-seated workout you’ve ever experienced! Join Ginny and Kristina for Yoga at the N4Cs. They offer a wide range of yoga styles, which give students the opportunity to explore their yoga practice and its amazing benefits. Yoga helps students with flexibility, balance, strength, and overall energy. Yoga is also very beneficial for those suffering from stress, anxiety, and depression, allowing students to breathe, relax, and let go. 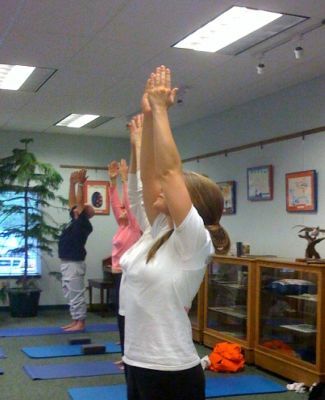 Students have the opportunity to enjoy Hatha Yoga, Vinyasa Slow Flow Yoga, and Vinyasa Intermediate/Advanced Yoga. Classes are open to everyone whether they have years of experience or none at all. Come and see what Yoga can do for you! We look forward to sharing this wonderful practice with you. 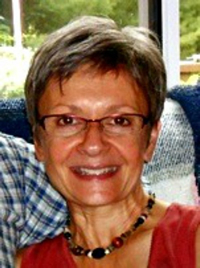 Ginny has been teaching Hatha Yoga to diverse populations since 1994. She enjoys sharing an awareness-based, insight-driven class that encourages students to learn about themselves through movement and to safely and wisely expand their capabilities. Increased strength, stamina, and flexibility are just the beginning benefits of a yoga journey. with continued practice, students report increased calmness, steadier emotions and more ease in flowing with the ups and downs of life in general. 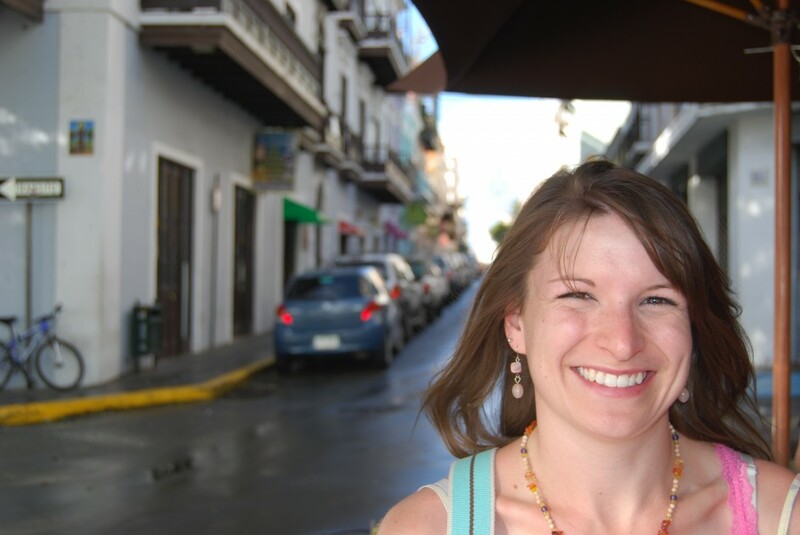 Kristina has been practicing yoga for more than 9 years and in 2013 completed a 200 hour RYT teacher training at Twin Cities Yoga Collective, centered on a foundation of Vinyasa and Ashtanga yoga styles. Ashtanga focuses on the use of poses to end the distractions of the mind, while Vinyasa works to unite the movement of the body to the breath. Her classes place an emphasis on connecting breath to movement, improving balance and flexibility and increasing strength while learning to relax and let go.